$15 ticketed dinner ($6 children 10 and under) and all ages performances with Delano community, Darleen Mabalon Kelly, Little Manila Rising, Pin@y Educational Partnerships and more. 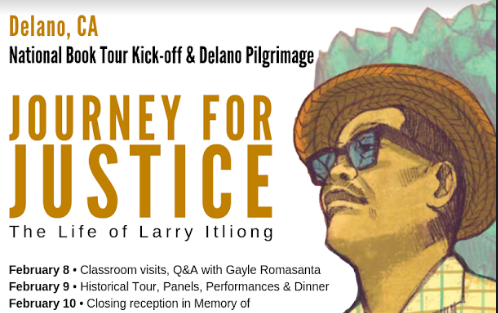 National book tour “Journey for Justice” The Life of Larry Itliong” is kicking off in Delano next month. The three-day event includes panel discussions, children’s readings, Q & A with the co-author and illustrator, dinner, performances, a dedication mass for Larry Itliong and Dr. Dawn Bohulano Mabalon, and a closing reception. Itliong co-founded the UFW with Cesar Chavez on August 22, 1966. He organized the Filipino American laborers and became a union organizer for the Agricultural Workers Organizing Committee (AWOC), says a news release. When he led Filipinos in the Great Delano Grape Strike on September 8, 1965, he contacted Cesar Chavez and asked for the Mexican farm workers to join the strike with them. On September 16, Cesar Chavez and the National Farm Workers Association (NFWA) joined the Filipinos in the Great Delano Grape strike. In 1966, AWOC and NFWA merged to become the United Farm Workers Organizing Committee (UFW). The farm worker movement became one of the greatest social justice and economic movements in California and the United States. This is the first nonfiction illustrated children’s book about Filipino American history, and the first book ever written about Larry Itliong, a Filipino American and United Farm Workers Labor Leader, according to a news release. The children’s book, written by the late historian Dawn Bohulano Mabalon with Gayle Romasanta and illustrated by Andre Sibayan, tells the story of Itliong, his migration to the United States and his lifelong fight for a farm workers union. “’Journey for Justice’ is a significant children’s book about a legendary pioneer in the farm workers movement,” said Emily P. Lawsin, Filipino American National Historical Society Vice President. “Journey for Justice: The Life of Larry Itliong,” a is 15-city national book tour, starting with Delano Feb. 8., the death anniversary of Itliong, with other events planned in Seattle, WA; Wapato, WA; New York; Washington DC; Virginia Beach, VA; Honolulu, HI; Anchorage, AK; Southfield, MI; Lansing, MI; Chicago, IL; San Diego, CA; Houston, TX; Stockton, CA; SF Bay Area; with more cities to be announced.